Boost Curb Appeal on a Budget | Raise home equity with solar lights, decorative stair treads, and more. © 2016 by Kelly Smith; all rights reserved; may not be copied or republished without permission. This article was updated on 8/13/18. Everyone knows that outstanding curb appeal goes a long way to helping you sell a home; any real estate agent will attest to that. But what if you are not planning to sell? Some changes to boost cub appeal (and home equity) still makes sense. After all, home is the place you come back to every day after a hard day of labor. Doesnt it make sense that the old homestead should be easy on the eyes? And that adding curb appeal can be done any time of the year, not just when the spring cleaning strikes you. The good news is that many of these changes do not have to break the bank. Lets look at a few. Install Rubber Treads on a Stair Walkway. Not all homes have stairs on their walkway up to the front door but many do, especially homes in hilly neighborhoods. And face it, most of these stairs are just ugly. Luckily, scrollwork pattern rubber treads are available to not only dress them up but also to make them safer since they are inherently non-slip. In addition to their aesthetic value they also remove dirt from shoes before you or a visitor gets to the front door. They are a snap to clean with just a garden hose equipped with a spray tip. These planters are very versatile. Think about flowers whose colors match or complement the color of your home. You will usually find them for sale in a nondescript plastic pot but the plants can be easily transplanted into an attractive planter lined with coconut fiber. It is even possible to use them to grow a variety of herbs. Add Potted Plants to Your Walkway. 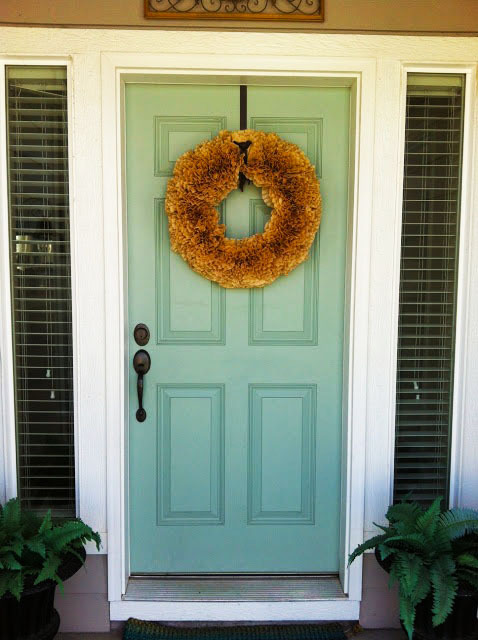 The front door is the natural focus of your home. Walking up to it should be inviting to your visitors. For a formal look place matching terracotta planters, either round ones or rectangular ones to give the illusion that your walkway is longer. For a more eclectic look use colorful glazed containers. You can alternate the colors to reflect the changing seasons. Add an LED Light and Address Plaque. If you ever order pizza you are well aware of the need to have your street address prominently displayed. Yes, it can be missed at night. Fortunately, solar-powered lighted address stakes are available to make your home impossible to miss, as well as brightening up your front yard. Face it, most doormats are downright boring. They are there to serve the purpose of last-chance shoe cleaning before entering the home. It doesnt have to be that way. Choose a new mat that is not only functional but expresses your personality. A wide variety is available whether you are looking for color patterns, a humorous doormat , or an expression of support from your alma mater. Get creative and impress visitors. Have You Seen Outdoor Window Treatments? Probably not. They are gaining in popularity though, and for many good reasons. Visualize drapes or curtains that reside not inside your home but on the perimeter of your porch or pergola. Among the benefits are privacy and shade—where you need it and when you need it. Be sure they are moisture, mildew, and fade resistant. Consider Adding a Front Porch. I know what youre thinking. "Thats not low-budget!" But it can be. It doesnt have to be huge and it doesnt have to feature fancy steps of railings. All you need is room enough for a couple of rocking chairs and a small table to set the morning coffee and the afternoon lemonade on. Brighten the Path With Solar Lights. Most likely you have seen these adorning the sides of driveways and walkways. The good news is that they are much less expensive that they were when first introduced several years ago. Theyre not designed to provide blinding illumination but to add ambiance and mood to your property and landscaping. Theres no doubt that mulch placed at the base of your trees adds beauty and ensures moisture retention. Unfortunately, you still need to weed it periodically and beef it up each spring. Many homeowners simply dont enjoy those chores. The answer is a recycled rubber mulch mat tree ring . It will last for years, allow water to penetrate, and keep weeds at bay. A New Coat of Paint for the Front Door. Another thing a real estate agent will tell you is that people focus on the front door when they look at your home; its just human nature. Then why are most front doors so drab? Who knows. But, you can do something about it. Slapping on a new coat of paint in the color of your choice is as easy as 1-2-3! Just be sure top use a color that will keep you out of trouble with your homeowners neighborhood association. Did you find these ideas helpful? Tell your friends and if you have any curb appeal boosting ideas of your own share them with our readers in the comment section below.